Sometime in early January of 1964, Kathy McAdam screamed up the stairs to her little brother, “Michael, hurry up they’re on the radio!” At first listen, even to the ears of a little kid, Michael knew that this was not like most of the so-called rock ‘n roll that plagued the airwaves in the early sixties. It felt like years until he and his sister got their first glimpse of The Beatles live on the Ed Sullivan Show just a few weeks later. McAdam still calls it “maybe the defining moment of my life.” He immediately withdrew to his bedroom with Kathy’s guitar (she had wanted to become the Joan Baez of Richmond, Virginia) and she never got her hands on it again. Within a few months McAdam, his cousin Johnny O’Brien, and several other Beatlemaniac kids in the neighborhood put together what would be the first in a string of garage bands that would play the latest hits by the Beatles, the Rolling Stones, and other British Invasion bands. By junior high school his first working band, Emotions, was formed with friends Mark Corvino, Kurt Williamson, and Bobby Armstrong. 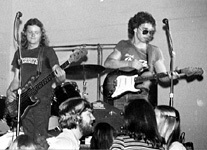 The band continued working through high school, adding vocalist Jimmy Morgan and playing high school dances, bars, and fraternity parties around Virginia college campuses. They even won the Virginia “Battle of the Bands” in 1969. “Maybe the defining moment of my life,” says McAdam. In 1970, because there was an established R&B group called The Emotions, the band changed their name to Brelo Magruder. “It was a stupid name based on silly inside jokes, but it was a good band,” McAdam explains. After high school, the guys in the band went their separate ways, all continuing to play music. After a brief stay in the Virginia Commonwealth University department of music, McAdam bummed around Cocoa Beach, Florida and Chapel Hill, North Carolina for a while, but he wound up back in Richmond. He hooked up with an R&B group called Natural Black, which became “Natural Black and Company” when McAdam and Charlie Kilpatrick, the other white kid, joined the band. After about a six-month stint with NB&C, McAdam and old pal Jimmy Morgan moved to Nagshead, North Carolina and began performing as “The Wrong Brothers.” The duo saw a summer that was “a ton of fun but not the most musically fulfilling thing I’ve ever done.” McAdam and Morgan moved back to Richmond to put something together with a rhythm section consisting of old friends and bandmates. What they came up with became known as The Good Humor Band. The Good Humor Band quickly became one of the most popular bands in town, and after some initial personnel changes, one of the most infamous bands in the mid-Atlantic region (see more at www.goodhumorband.com). The GHB enjoyed a reputation for first-rate musicianship, having a repertoire of hundreds of songs, and yes, a penchant for somewhat wild behavior. During his GHB tenure, McAdam also appeared on recordings with popular regional artists such as Steve Bassett and Robbin Thompson. The GHB continued to play an exhausting schedule on the East Coast bar circuit for eight years. After recording a very respectable album in 1982, the band still failed to garner any major label interest. The GHB split up in January of 1983, but all was not lost. Most of the former bandmates eventually went on to become sidemen and session players for some of the biggest names in the industry. To this day, the band does an annual reunion show in Richmond. The next three and a half years found McAdam constantly touring the U.S., Canada, and Europe with Steve Earle and the Dukes. He recorded his first major label album, Exit 0, with Steve as well as numerous singles and a movie soundtrack. Countless videos and television appearances followed. A phone call from another GHB alumnus, Bruce Bouton, landed a gig with Foster and Lloyd, one of the other hip, yet unsigned, young country acts of the era. What little time McAdam had off from Steve was spent touring with Foster and Lloyd. The constant touring went on until 1990 when more studio work started to trickle in, eliminating the need to always be on the road. Tours and sessions with artists like Matraca Berg, B.J. 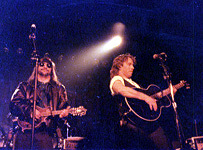 Thomas, Deana Carter, Lee Roy Parnell, and Mary Chapin Carpenter kept McAdam busy through 1990 and 1991. 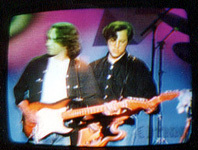 By 1992 Radney Foster and Bill Lloyd had gone their separate ways, becoming solo artists. McAdam accepted an offer from Radney to be his bandleader/guitarist/right hand man. Despite a number of tempting offers from other artists including the Mavericks, Marty Stuart, and Travis Tritt , Mike stuck with Radney, touring and recording for the next three years while doing session work in Nashville and Muscle Shoals on the side. By 1995, Mike and partner Jack Irwin completed construction on their own recording studio, Silvertone Recording Service. While Radney was taking a two-year hiatus from touring and recording, McAdam kept himself busy working with Jim Lauderdale, Greg Trooper, Charlie Major, Jeff Black, Jack Ingram, Sawyer Brown, Flaco Jimenez, Matraca Berg, Charlie Robison, Bruce Robison, and numerous other indie album projects. 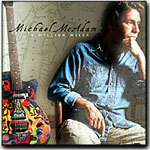 In the late 1990s, McAdam began work on his own solo album which was to become A Million Miles, while doing sessions and one-offs with artists like Amy Rigby, Southside Johnny, Chris Knight, Pat McLaughlin, Deana Carter, Kevin Welch, Bill Lloyd, Lee Roy Parnell, and others. This brings us to the current decade in which McAdam continues to produce and play guitar for numerous artists, including Radney, while still playing occasional gigs with Steve and many other artists. McAdam’s self-produced solo effort, A Million Miles, was completed at Silvertone in October of 2002. The album contains eleven songs, ten of them originals, with vocal performances that may surprise those who have only heard McAdam’s guitar work in the past. The songs are insightful and the production is stellar. A Million Miles was released in December on his own Permanent Records label. “Maybe the defining moment...” he chuckles. Perhaps a defining moment, but probably not the last in this long, still promising career.